A new focus on teamplay has left behind LoL's lone wolf superstars. Joshua “Dardoch” Hartnett has had a tumultuous 2017. The player has just moved to his third organization since the Spring Split started, playing on Immortals, Counter Logic Gaming, and now returning to his first organization, Team Liquid. It’s a puzzling move for both the player and the organization, and it caps off one of the weirdest regular seasons we’ve had in the North American LCS so far. As far as surprise roster switches go, it’s not as momentous as Doublelift heading to TSM, but it does raise some interesting questions... especially since Dardoch and Team Liquid originally parted ways on such bad terms. Dardoch exploded onto the North American scene, graduating from Liquid’s Academy team to join the starting lineup in Spring 2016. Dardoch was replacing IWillDominate, a veteran jungler, and immediately proved himself to be a strong mechanical talent. Even in games that Liquid couldn’t quite take to the finish line, Dardoch consistently stood out as a strong talent. He earned the Rookie of the Split award, and a host of fans. Some rookies, like Phoenix1’s MikeYeung, keep their head down. Others stand out as a strong personality. Dardoch earned a following of fans for being blunt, charismatic, and willing to talk a little trash. In an esport that can sometimes feel sanitized to the point of staleness, a personality like Dardoch can be a breath of fresh air. He’s an intelligent, articulate young man—and it’s worth noting that he is nineteen years old—and he has the makings of a superstar. Skilled, able to give a great interview on the spot, and surprisingly thoughtful. There’s one problem, although it's likely a more complex one than any of us realize: Dardoch has struggled to work in a team environment. League of Legends has been slowly moving away from being a game where one person can pop off and carry a game on their back. It’s still possible for a strong player to influence the game that he is in; there’s a reason why Faker is so respected and admired for his performance as a mid laner, even when SKT T1 as a team seems to be in a rough spot. That being said, the power has shifted from a strong carry into a cohesive team playing on the same page. AD carries have lost a substantial amount of power, mages who can run away with a game like Azir and LeBlanc have been hit with the nerf bat, and there are very few instances where a player can completely run away with a game. There were instances where Dardoch was able to completely run over an enemy team. In a playoffs game against NRG in 2016, Dardoch built a full offense Lee Sin, and the casters laughed incredulously as he built a solo queue build and still managed to go 12/2/6. More commonly, Dardoch would struggle to build momentum off an early play while the rest of his team fell behind. Tension mounted behind the scenes that carried through into the summer split. In May, Dardoch was suspended by Liquid... and quickly returned to starting play after a rough performance by his replacement, Moon. Soon after, he left the team. In November, Liquid released a nearly two hour documentary called Breaking Point. The YouTube summary hooks viewers with the following: follow an incredibly skilled rookie, Joshua "Dardoch" Hartnett, as his ideals clash with a world championship veteran and experienced head coach. Will management choose the raw talent of upcoming superstars over the environment created by this correlation of players? The answer was clearly no, and Dardoch signed a three year contract with Immortals. After Immortals finished seventh in the Spring Split of 2017, he was traded to Counter Logic Gaming in exchange for Xmithie. 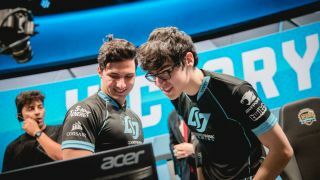 Counter Logic Gaming was seen as a great home for Dardoch. It was a strong team that had contended for a top spot in North America, and won two championships in the recent past. It was a team stacked with veterans, including coach Tony “Zikz” Gray. Then CLG stumbled, falling against other top teams—including Immortals, twice. Omar “OmarGod” Amin was subbed in for a few matches. On Tuesday, the other shoe dropped. Liquid released a video, welcoming home the prodigal son. Even the caption, “Heeeeee's Baaaaaaaack”, suggested a certain audaciousness in this roster move. CLG’s statement was a little less cheeky, explaining that Dardoch didn’t fit in with CLG’s goals of “teamwork and culture”. So what happens now? Every organization who parts ways with Dardoch stresses that he’s a strong mechanical talent, a player capable of being one of the best in his role. The issue has never been one of skill, drive, tenacity. Esports is still a young field, developing infrastructure to deal with internal issues, and Dardoch himself is a young man. To write him off forever would be folly, and he still has a host of friends among other players. So, why did Liquid bring him back into the fold after such a highly publicized and dramatic ending to their previous working relationship? In some ways, Dardoch’s pattern of behavior has remained perfectly consistent. Meanwhile, Liquid has been all over the place. They recently picked up Phoenix1’s previous jungler, Inori, and the Korean player Mickey for mid lane. The goal is to field a 10 man roster, with Inori, Dardoch, and possibly Reignover presumably sharing time. With Worlds approaching, and Liquid struggling with a 4-10 record, it seems like Dardoch will have some time to cool his heels while Worlds rages on. Pundits have suggested CLG may have been Dardoch’s last chance to prove himself as a team player, and with the recent announcement, his future is uncertain. At the same time, if there’s anything consistent with Dardoch’s career over the last two years, it’s been a bull like tenacity and refusal to give up. It’ll be a long climb back to the top, but no other player may be more dedicated to digging his heels in and starting the journey again from square one.